St. Matthew's Lutheran Church, a member of the Evangelical Lutheran Church in America (ELCA), is the largest Lutheran church in South Carolina with nearly 1900 baptized members. The congregation, currently pastored by Eric Childers, assembles in one of Charleston's many historic houses of worship---all of which prominently dot the cityscape, earning the city its nickname, "The Holy City." 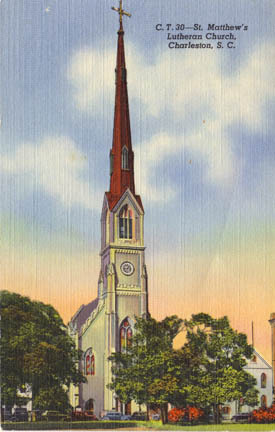 Established by German immigrants in 1840 as the German Evangelical Lutheran Church of Charleston, the congregation dedicated its first building in June 1842 at the corner of Anson and Hassell Streets. Former Charleston mayor and Confederate General Johann Andreas Wagener served as the church's first president. The original sanctuary, built at a cost of $8,000, seated 400. St. Matthew's---both its parishioners and its building---would endure adversity, particularly within the first few decades of existence. Church records indicate 400 burials in 1858 as a result of the city's yellow fever epidemic. However, damage sustained during the Civil War was minimal. Construction for the present-day building began in the late 1860s, and the sanctuary was dedicated on March 28, 1872. According to the local press, an estimated crowd of 3,000 marched in procession from the Anson Street building to the church's new location at the corner of King and Vanderhorst streets. The building, designed by architect J. H. Devereaux, cost $12,000, a hefty sum in the late 1800s. Reportedly, South Carolina Governor William Aiken had contributed the first $100 to build the church. Interestingly, the project to restore the church following a tragic fire almost a hundred years later (in 1965) cost half a million dollars. Singularly, this vintage post card would make a great addition to the Cotton States Archive. Coupled with the accompanying modern photograph by Matt Neal, however, it makes for a great "Then and Now" discussion and comparison. Postally unused, the age of this card is unknown. The automobiles in the foreground would suggest the 1930s. Too bad I haven't been able to locate a postcard featuring the original Anson Street building. 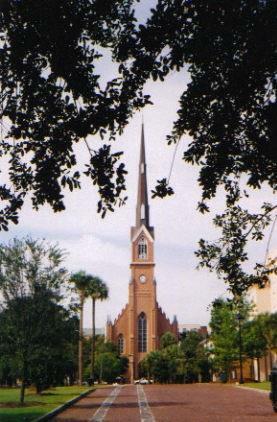 St. Matthew's Lutheran Church is located at 405 King Street between Calhoun and Vanderhorst streets in beautiful, historic Charleston. "Serving Christ from the Heart of the Historic City"
Today, St. Matthew's Lutheran Church is more than just an attractive landmark for tourists to admire or photograph. The building itself stands as a symbol of endurance and faithfulness in a city that has weathered many storms---both figuratively and literally. More importantly, the people that make up St. Matthew's take outreach seriously by actively participating in ministries and programs that affect a variety of ages and needs within the community, including Quality Time Respite Care for Alzheimer's patients and English as a Second Language. Author: Greg Freeman. Published August 4, 2007. Updated on January 6, 2018 to reflect that Eric Childers has replaced Cameron Keyser as Pastor. All materials contained on this site, including text and images, are protected by copyright laws and may not be reproduced without prior written permission from the publisher. Where applicable, use of some items contained on this site may require permission from other copyright owners. Fair Use of text from SouthernEdition.com is permitted to the extent allowed by copyright law. Proper citation is requested. Please use this guide when citing a Southern Edition article.